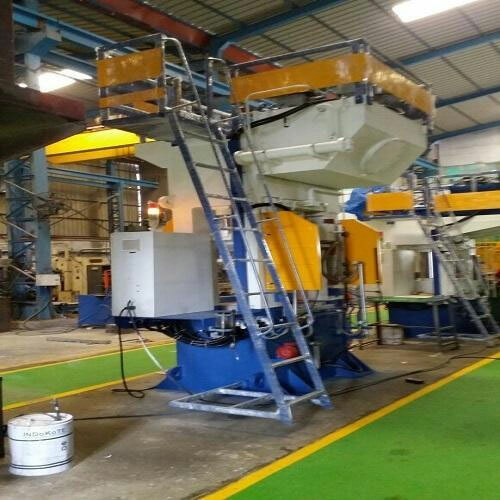 Santec's 'H' TYPE or Fabricated 4-column type hydraulic presses are heavy duty and their frame is manufactured using ultrasonically tested quality plates of suitable thickness. These presses find extensive application in deep drawing compression moulding. 'C' Frame Type Power Press is configured with the use of latest technology. These optimally functional presses are simple to install and requires minimum maintenance. They can be customized as per the specific needs of the customers. Santec offers 4-nos Hard Chrome Pillars Type Presses in different technical specifications. The guide of this type of press offers excellent slide accuracy of the moving ram and the platen, resulting in reduced tool wear and an increased service life. Santec presents hi-performance Straight Sided Press that features heavy duty frame fabricated from stress relieved steel plates. These presses have a centralized control system with inch, semi auto operation. The cartridge valve has Hydraulic controls which ensure precision in performance. Santec offers 8-Point Gib Guided Hydraulic Press with lubricated bronze bearing for a durable rib surface. These press have gib guided stability that provides speed with precision. Our range of hydraulic press have a longer service life. Santec offers 8-Point Gib Guided SANTEC' Manufacture wide range of Hydraulic Presses as per Customer's specification & requirements. We have continued to grow from the day our Company was founded. This Success is based on our customer's satisfaction. It is our constant endeavour to confirm & extend this Confidence is us. Major Components of a 'H' type Press Consist of the bed, side Housings (uprights), crown & slide. The bed often has a removable bolster & sometimes contains one or more die cushions for deep-drawing operation.